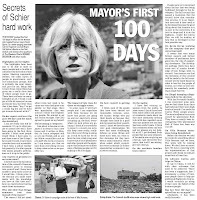 In the Weekend Post (the fancy name for the week day Cairns Post), Roger Dickson reviews our new Mayor's first 100 days behind the desk. Roger searched high and low to find the most flattering photo of our 1st Lady. Good one Rog. Overall, he was reasonably critical about the pre-election promises that seem to have not been met - pay rates of Councillor, rate rises, general flip flopping etc. However, in an email out to her Cairns 1st supporters today (I used to be on that list), she takes her right of reply and says a lot has been achieved in the first three months. "We said we'd do something about Villa Romana - the former Council had been sitting on a letter from the Dept Natural Resources for months - and the walls will come down soon," Val says. The new Council did indeed support this, however the legal challenge will be interesting, as is far from over. Villa owner George Papagelou will not take this one lying under a vat of pasta sauce, of that I'm sure. However, Byrne's mob should be ashamed of how they handled the whole fiasco. 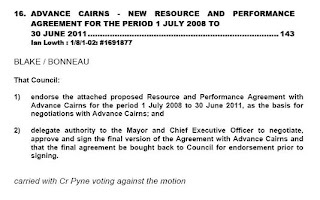 Val also said in her letter that she promised to review the Council's funding of Advance Cairns. "They've got a new strategic plan and structure, have a new CEO and changed direction to promote economic diversification; and know how important it is to get some runs on the board." Well, this is not entirely what Val wanted to do. It certainly doesn't stack up with the pronouncement pre-election. I was in the audience at that fine Cairns establishment during the Mayoral debate that sunny day in March, and I recall there was a rather different tone. I suggest you watch the videos I filmed on the day. Forgive the video quality, they're a bit shaky, I didn't have my tripod, and filming Kev... what can I say!). Check out this video (at 07:15sec) and Val said that she would undertake a review of Advance Cairns. Well, this didn't happen at all. The then interim Advance Cairns CEO got wind of Val's plans, which were very laudable, and overdue. They got away with a free ride before. For too long, this quarter of a million dollar publicly funded quango has flown under the radar. China trips came and went for eight years, each time stacked with a myriad of business folk, along with the mayor and his staff, travelling on the public purse. The reports from these trips were only ever shared in private closed door Council sessions. They were perceived to be unaccountable to the public. And they were. An open, honest and independent review was needed, when the new Council administration took office. That is what Val wanted to occur, of that I'm sure. This never happened. This subject is dear to my heart (and wallet) as I've been a rather prominent critic about outcomes from Advance Cairns and it's love affair with all things China, under the direction of our former Mayor and Kev's mate David McGuire (now working in China. Funny that.). The other 'achievement' Val says is that she gained more public input into the beaches town centre. Certainly, the outcome is better than was planned under the previous Council. "I said we'd make sure that there was proper consultation around the proposed Smithfield town centre and Council officers will drive a longer consultation process with all stakeholders," says Val. However, the previous plan, that was driven and initiated by LHL (the developers in partnership with the land owner, and also Flanagan Consulting, should have been dismissing in it's entirety. The then Councilor Annette Shepard advocated that, her last defiant speech from the throne. And she was right. Val also gave a number of other areas where she focused on her Cairns 1st agenda, like better animal management. "We are well on the way to that." However, CairnsBlog readers will know my views on telling me how to look after my pets. I see a cat fight coming up. Val also said that they'd have "more real engagement with community". They've taken meetings to the people in Mossman and plan to go to Babinda. Big deal. Anyone could have organised that. We need real engagement with the community, whereby every Councillor is mandated to be actively involved in community meetings and residents' associations. You know who I'm talking about. The new Mayor says they're getting the meeting agendas out on the web six days in advance. That is a positive change. Congrats. I was rather critical of the former Cairns Shity Council's website. It often had stuff moved, and meeting minutes were removed soon afer being put online. "Nothing sinister here. They are not "missing" and there has been no "cover up". For the last 7 years the minutes (from all Council committees) have been published on the web site. They are removed,(from the web site), after 4 months, thus leaving the current and more relevant committee minutes available for perusal. To my knowledge, no one has complained about this until now, care of Mr Michael Moore. There appears to be an unhealthy touch of paranoia about this CairnsBlog and it creator." Val said there has been an increase in deputations addressing the full Council. They now also allow people in the public gallery to speak at meetings. Fantastic. Actually, speaking from the public gallery at meetings was one of my suggestions when I helped write the final Letter from Val. Regardless, these are good additions to the democratic process. "Di Forsyth, Kirsten Lesina and other councillors are working hard and taking their responsibilities seriously," says Val. "We're in the early stages of developing a sustainability framework for the region which will guide future infrastructure and growth." However the budget and it's upcoming rates increase, will be a mammoth PR disaster. "We've planned the new budget which will be detailed on 23rd July," Val Schier says. "Unfortunately, there will be a rate rise as we must plan to deal with increased costs, increased demand on services, unfunded depreciation and an operating deficit which the Queensland Treasury Corporation says is not financially sustainable," Schier says in the letter to her Cairns 1st supporters. "We've copped flak about salaries despite me being paid equivalent to Kevin Byrne (and having the former Douglas Shire added on to the job! ), and despite the total wages bill being more than $300K less than it was for the previous 2 councils with their 18 councillors," says Mayor Val. I don't care how much they get paid, because it's a often a seven-day-a-week job, so long as they mange with integrity and consult. Little signs of that in regard to rates. "As you all know, we've come into the new Council at a time of significant economic turmoil: global economic uncertainty, peak oil, climate change impacts, interest rate rises which are hurting home buyers, massive increases in prices; eg, steel has gone up 84% since last September and this is having a huge impact on all Council's works projects - the cost of upgrading 4 sewage treatment plants has blown out from $90M to $188M!" Val Schier says. "It's been a challenge but, as Deryck said, 'If it were a footie game, you're only 10 minutes into the first quarter,' (AFL that is! ), Val says. "There's still 3 years and 9 months to go and I will spend that time in my usual determined way doing everything I can with my fellow councillors to ensure that we make the best possible decisions." Well, only three months in - or 10 minutes - and the ability to direct and manage a budget within our (their) means of what can be spent, shows little sign of professional management. I know the Mayor's vote is only one vote, but she can and should lead the debate and set the direction. She should also direct the strategic vision. I fail to see how a huge rate grab, just two years after the last one, will instill much faith in this new Council, which has hardly warmed their seats. I'm glad that Councillor Robert Pyne for one, has had the balls to come out and say this is not responsible financial management. Robert told me today that there's a high chance that all the projects budgeted for in the next 12 months, will not be achieved in the period. "The surplus will then of course be rolled over till next year. And so on," Pyne says. He fought hard at last week's Planning meeting to review vacant unused Council-owned land to be sold, in order to offset such high rate increases, but the majority did not even support a review. Are these folks clowns? If so, they're high-paid clowns. This Council will wear the reputation from it's residents of having a great deal less faith in their ability to govern in a responsible and prudent manner. I loathe the fact that the Mayor could be so vindictive, that in an email letter to this (previous)supporter, she lists as her Number One achievement in the first 100 days as the ability to destroy someone else's livelihood (along with their hardworking employees)ie knocking down the walls at Villa Romano. I am surprised that Robert Pyne would be supporting this, and Alan Blake as well. In fact any right thinking councillor. well, Val wears flip flops ya know!!! Anything was better tha bully byrne. anything. i'd even have Sno running the place .. god forbid!! l voted for Val and she wont get my next one! Rob Pyne is correct. Council land should have been sold off before any rate rise. Val and her Councillors have made, I think, another fatal mistake. I can't understand why they didn't do this, nor can I understand why the early discount was scrapped. Complimenting Rob Pyne on his "balls" is nice, but where is the alternative plan? it's easy to be a bomb thrower - it's a lot harder to actually produce and sell productive alternatives. I didn't see anyone vowing to cut the bloated council payroll and staff. I didn't see anyone cutting services to keep rates static. And I wouldn't expect it. We now have a profligate Labor council, who never cut a job in their life. Balls are irrelevant in this discussion. How about some ideas, Rob? One week Rob Pyne says council should sell land to offset rates rise, the next week he says council should buy a hill, it's a BARGAIN! I am not sure whether he is doing jazz or rock n roll. Either way it is all entertaing. I do have some ideas in that area and all you have to do is ask me, Critic or anonymous. Call me on 40363360. I do not want to 'cut jobs' but want to look at limiting expenditure in a number of areas.